This year's Noir City: Chicago seemingly borrows a title from classic of the genre itself: Out of the Past. Rode, Muller’s partner in noirdom (and an FNF director-treasurer), reports the concept worked really well when they reprised it in Hollywood in April. “We had to cheat a bit to program ‘The Scarlet Hour’ (pictured below) since it’s a 1956 B-release paired with a 1952 A-title ‘The Turning Point.’” But they couldn’t resist because it’s a rarely seen noir by Hollywood heavyweight Michael Curtiz (the subject of Rode’s latest book, Michael Curtiz: A Life in Film, as well as a current retrospective at the Music Box). This year’s festival kicks off with two ’90s neo-noirs directed by Carl Franklin, “One False Move” and “Devil in a Blue Dress.” “As much as I’m loyal to hard-core fans who want to see older, classic movies, I want to be able to take advantage of the moment,” Muller said. 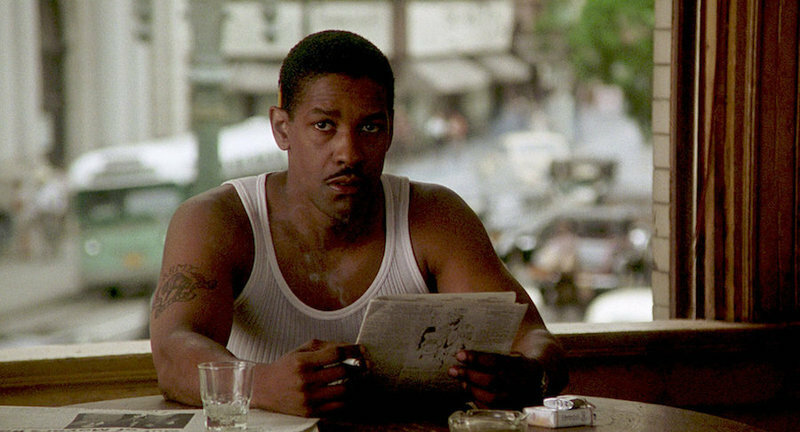 “It’s important to show that noir is not calcified. I see a natural extension from noir to current cinema. Plus, it’s interesting to see the African-American perspective on this genre.” Though he’s currently making a film in Pittsburgh, Franklin will appear opening night for post-screening discussions. “He’s willing to go the extra mile to be in Chicago for Noir City,” Muller said. “Conflict” (1945), Aug. 18, 3 p.m.: Reverting to his heavy roles after his transformation as a romantic hero in “Casablanca” (1942), Humphrey Bogart plays a murderous husband with designs on his wife's sister. Rode regards “Conflict” as “one of Bogie's most overlooked films,” in part because the title was shelved for two years over a rights issue. “The Blue Dahlia” (1946), Aug. 18, 7 p.m.: This classic noir, penned by Chicago-born crime-fiction icon Raymond Chandler, gives Alan Ladd one of his signature roles as a returning soldier accused of murdering his unfaithful wife (Doris Dowling). It reteams Ladd with Veronica Lake, after their successes as Paramount’s leading romantic duo in “This Gun for Hire” (1942) and “The Glass Key” (1942). “Strange Impersonation” (1946), Aug. 18, 9:15 p.m.: Beset by blackmail, a scheming assistant, a disfiguring accident and romantic betrayal, a research scientist (Brenda Marshall) plots her revenge. “I have a soft spot for B movies that make absolutely no sense,” Muller said of this pivotal early film by director Anthony Mann. “I love the ones where there's some sort of weird science in a crime film. And this film is right in that sweet spot." “I Walk Alone” (1948), Aug. 19, 6:15 p.m.: After a 14-year stretch in the slam, a Prohibition-era bootlegger (Burt Lancaster) discovers his former partner (Kirk Douglas) has no intention of sharing the profits of their previous spoils. “It’s a great cast, with Burt and Kirk in the first of the seven films they made together, along with the always amazing Lizabeth Scott—a star fest in a cool Hal Wallis production,” Muller said. At the Music Box, “The Man Who Cheated Himself” will be shown in a restored 35mm print, funded by the Film Noir Foundation and the UCLA Film & Television Archive. Rode confirms the movie’s bona fides. “It stars Scott Brady, the good brother of Tierney family,” he said of the actor, the middle sibling of the Tierney acting clan. “They were on completely different sides of the spectrum in most movies.” Shot on location in Los Angeles and San Diego, “I Was a Shoplifter” features Rock Hudson, Peggie Castle and James Best in bit roles, and Tony Curtis as a sinister sidekick improbably named Pepe. “The People Against O’Hara” (1951), Aug. 22, 7 p.m.: In his only film noir, Spencer Tracy plays an alcoholic attorney who comes out of retirement to defend a neighbor’s son (James Arness, later of “Gunsmoke” fame) against a homicide charge. “Tracy’s character cuts close to the bone,” Rode said of this film, directed by Oak Park native John Sturges, best known for his epic actioners such as “The Magnificent Seven” (1960) and “The Great Escape” (1963). “Pickup” (1951), Aug. 22, 9:15 p.m.: Of this lurid potboiler about an older man duped by a femme fatale, Rode said, “the moment this one starts, you know you’re not talking about a truck.” Beverly Michaels, the film’s deadly dame, was married to Russell Rouse, author of the classic noir “D.O.A.” (1949), in real life. Their son is Oscar-winning editor Christopher Rouse (“The Bourne Ultimatum”). “I once asked him how it was like growing up in a noir nuclear family,” Rode said. Meanwhile, “Hugo Haas spent his career making bad remakes of ‘The Postman Rings Twice,’ with an older man being tormented by a younger woman.” And in “Pickup,” Haas plays the beleaguered husband (named Jan “Hunky” Horak) himself.